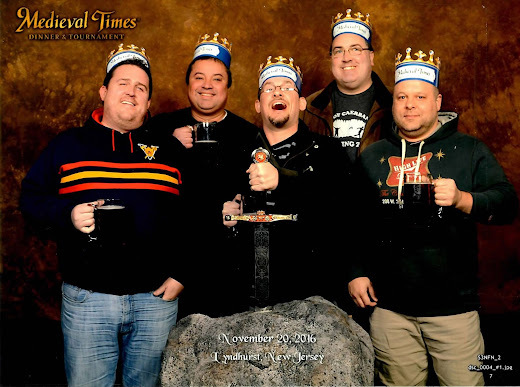 Met up with the Lads at Medieval Times to have a bit of post-season fun, down a few pitchers of mead and discuss what happened this season. For some of that, you can check out the video below but there was something like a half an hour where the camera wasn't rolling (and it should have been). After being let down for the 21st time it really shouldn't get me as much as it does. But it does. This was a pretty good Red Bull NY team this year but, in my honest opinion, I felt there wasn't enough quality there to get to the promised land (MLS Cup). A great regular season doesn't mean much if you can't get it done in the post-season and it wasn't to be for us (yet again). Hopefully next year there will be a few upgrades in personnel, Sacha Kljestan will be moved to his natural Defensive Mid position and we can get the Argie #10 I've been calling for. That last one is key. We need a guy who is explosive and isn't easily taken out in games (something that is crucial in the Post-Season) as Mr. Klejstan was. I envision Mr. Klejstan as a Shalrie Joseph-type, very creative DM, who can offer more in the attack than what we currently have back there. Yes, yes - 20 assists in the regular season, blah, blah, blah... But that doesn't mean crap if you can't get it done in the post-season, does it? Another thing I'm hoping for is that Mr. Marsch sees fit to switch the team to the 4-4-2 that other Red Bulls teams play. RB Leipzig is tearing up the Bundesliga at the moment with such a team and RB Salzburgh has won the title in Austria playing like that as well. BWP alone up top doesn't quite work out in the post-season and I'm hoping a two up top formation will see Gonzalo Veron (who is, supposedly, staying) partnering with BWP up top. And if not Gonzalo, then another quality forward. Or not. They can give us the same thing again next season and we'll wind up where we are now. With no MLS Cup. With other teams about to join the League and other teams spending big, a team like ours (who isn't going to spend big anymore) has to be smart in the player department. I hope they see what an Ignacio Piatti-type player brings to the table. Several teams with such a player have been successful (Portland just last year with Valeri, for instance). It's nothing I haven't said before but there are many (like in the media) who think otherwise. I'd like to thank the Lads pictured above (Kevin, Matt K, Matt C and Tom) for the friendship and for putting up with my ranting and raving all the time (even though I'm right and they're wrong ;) ). A shout-out as well to all my "Red Together" brothers and sisters. You know who you are.